For the last three years, I’ve avoided winters in Cape Town. At the beginning of each year when I sketch out my travel plans, I make a point to book a trip somewhere warm. In 2016, I spent the winter in Thailand. In 2017, I bounced around Ireland, Turkey, Armenia and Georgia. In 2018, I spent the beginning of winter in Italy, Germany, Poland and Amsterdam. But when I came home in July aka the heart of South Africa’s winter, I discovered that I actually MISSED the cold weather. Spending this past month in Cape Town in winter has made me realise how much the city has to offer any time of the year. Like having my first-ever snowball fight and photographing the milky way! Me, the girl who somehow manages to put the manual focus on at the worst possible time, got a CLEAR picture of the stars. 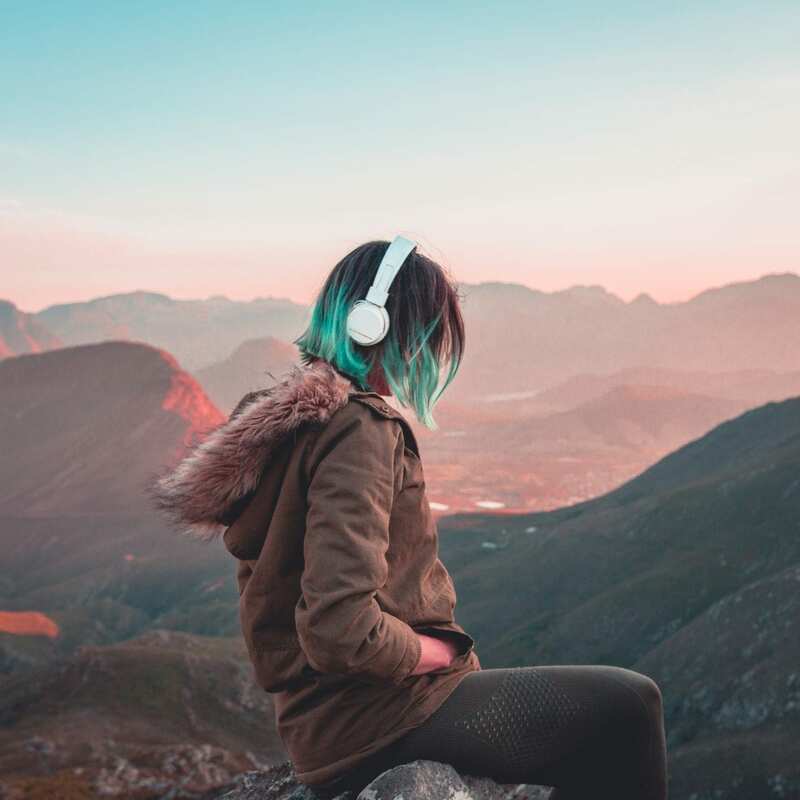 So if you’re in the Mother City for the first time or you’re a local like me looking to discover your own backyard, here are some of the best things to do in Cape Town in winter! CAN WE BE TRAVEL BFFS? Cape Town in the winter is cool to cold, and sunlight lasts from about 8:00 a.m. to 6:00 p.m. But the city is known for its unpredictable weather. You’ll want to pack layers that you can peel off when the day warms up and put back once the sunsets. Another thing you’ll need to dress around is Cape Town’s infamous “Cape Doctor”. It’s a strong south-easter wind that’s strong enough to blow you over move your car across the freeway and make the Mother City one of the world’s top destinations for kite surfing. But the good news is that you don’t need to pack your thermals. While temperatures can drop to 7ºC during the evenings, the days are usually sunny with temperatures ranging between 18ºC and 21ºC. Here are my top recommendations for what to wear in Cape Town in winter while you explore its top sights! 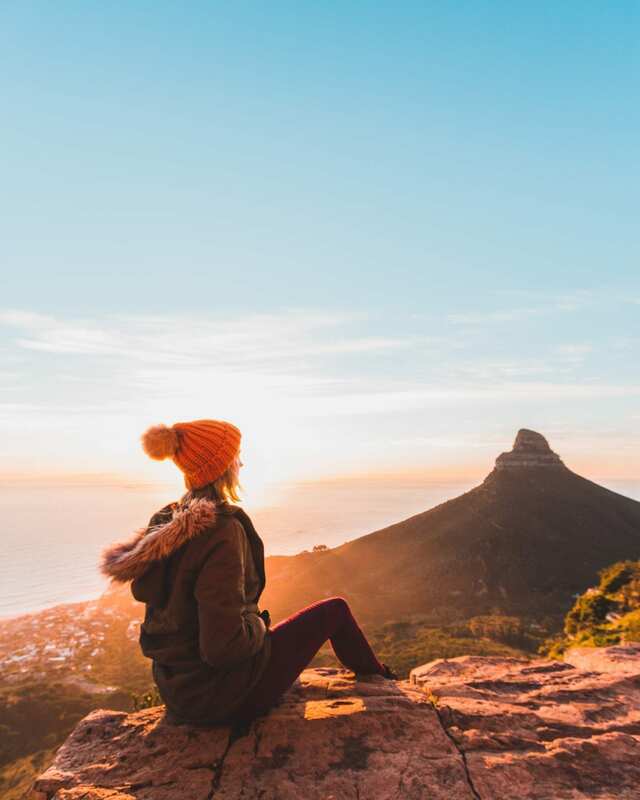 Waterproof hiking boots: No trip to Cape Town is complete without hiking one of the many scenic trails around the city. Bring a pair of waterproof hiking boots in case the winter rains make summiting Table Mountain or Lion’s Head more muddier than usual. Sneakers: Even if you aren’t planning to conquer any mountains, you’ll still need a pair of comfortable shoes to explore the city. Support a local South African brand, and pick up a pair of Vosk sneakers. Warm jacket and jersey: You’ll need one to keep the Cape Doctor at bay. But you don’t need to bring the thickest jacket or jersey in your closet. Cape Town isn’t the alps. A warm parka jacket and a chunky knit sweater will do the job. Day bag: My favourite day bag for exploring is this one from Freedom of Movement. Not only are they a South African brand based in Cape Town, but it’s got an anti-theft zip and can hold everything you need for the day. Your laptop, a water bottle, a raincoat, all your camera gear and an endless supply of snacks. T-shirts: It may be winter in Cape, but sometimes it feels more like summer. Be prepared for any unexpected warm weather by packing a few t-shirts that you can wear underneath your morning layers. Optional: If you’re visiting Cape Town in winter, you might get lucky and see some snow on top of the surrounding mountains. But if you want to get closer, make sure you pack gloves, a scarf, and a layer up to beat the chill. 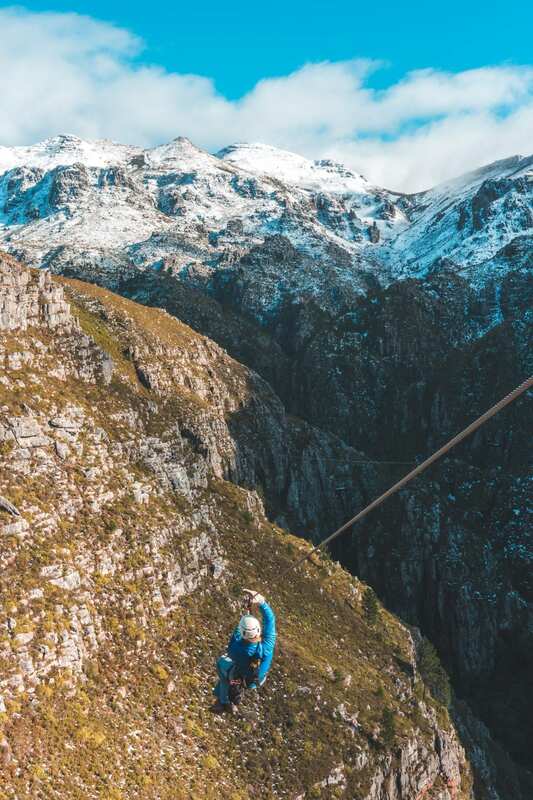 Beat the winter chill and go on a 4-hour zip-lining adventure with Cape Canopy in the heart of the Hottentot Holland Mountains. 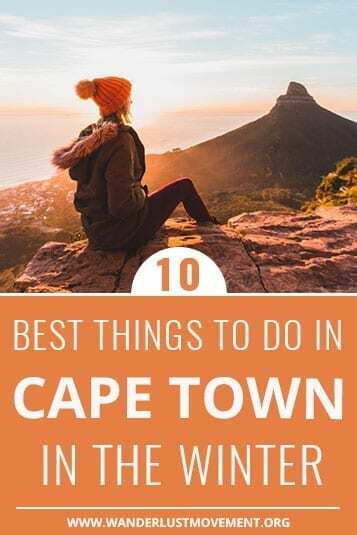 Located inside a World Heritage Site, and only a one hour drive from Cape Town, it’s one of the best things to do in Cape Town in winter -especially if it snows! I got lucky this year and got to experience my first ever white Christmas five months early. The snow transformed the mountain range into a scene you would expect to find in New Zealand. And it’s not every day you get to have snowball fights while zip lining across some of the Western Cape’s most jaw-dropping scenery! 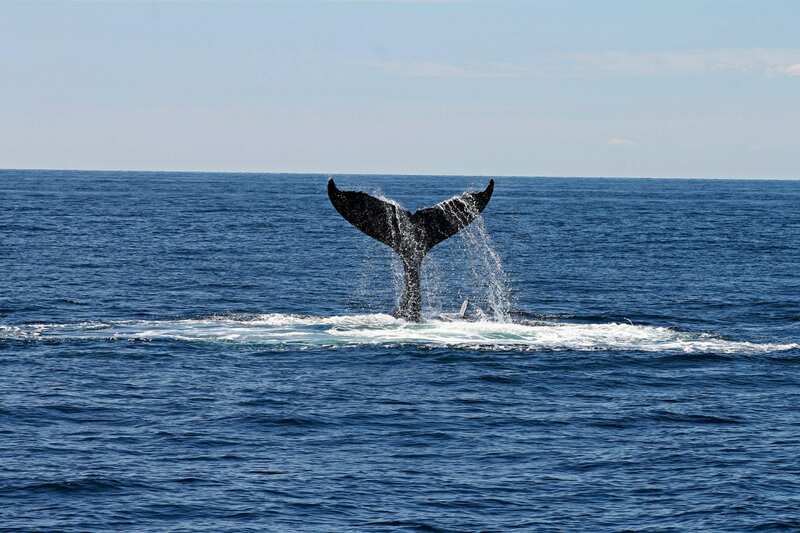 Each year, between June and November, hundreds of southern right whales, humpback whales and Bryde’s whales migrate along the coast of South Africa. It’s one of the best things to do in Cape Town in winter for wildlife lovers. Sign up for a boat tour and get up close with the ocean’s gentle giants. But if that’s out of your budget, take the train from Cape Town to False Bay! It’s one of the top whale watching spots, and if you’re lucky, you’ll get to see them up close when you ride between Muizenberg and Simon’s Town. You’ll be having such a whale of a time that you won’t even notice that pesky south-easter wind. And Narwhal, let’s take a second to appreciate my pun talents. Searching for things to do in Cape Town in winter that are off-the-beaten-track? Then it’s time to unleash your inner space nerd and go on an intergalactic adventure – just outside of the Mother City! Head to the village of Sutherland. 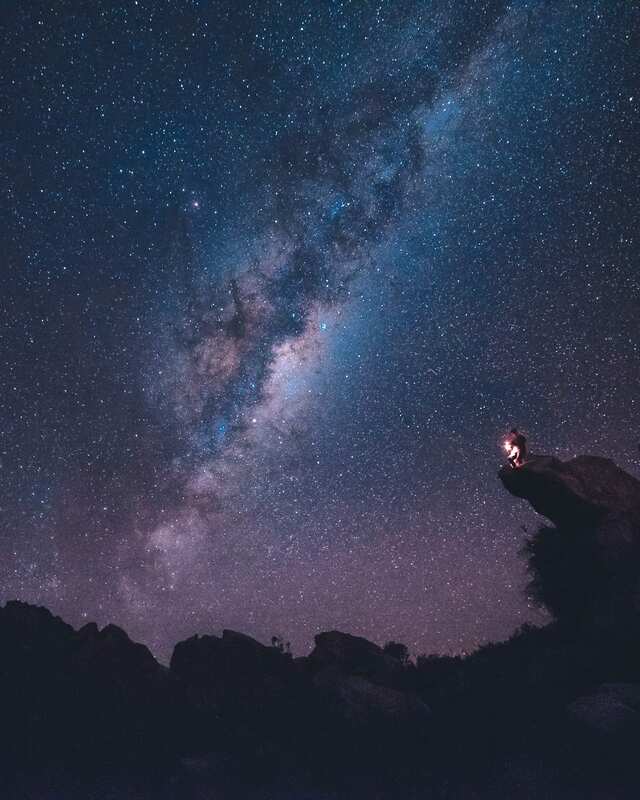 Located in the Karoo, it’s home to the largest telescope in the southern hemisphere and is famous around the world for its excellent star-gazing. You can visit the South African Astronomical Observatory, sign up for a two-day stargazing tour or grab your camera and capture the night’s sky by yourself. A closer option to Cape Town is the Cederberg. The area is known for its collection of protected San Rock Art and with hardly any light pollution – it’s a stargazers heaven. Book a night at Kagga Kagga. The lodge boasts an incredible sky deck, and you can hire a guide to teach you all about the constellations above. Budget travellers can bring along their tents, or you can splurge on their open-air star suite. Hiking in Cape Town is a quintessential winter activity! Temperatures are mild, the days are clear, and the sun is (usually) out. The only thing you need to worry about is the Cape Doctor. 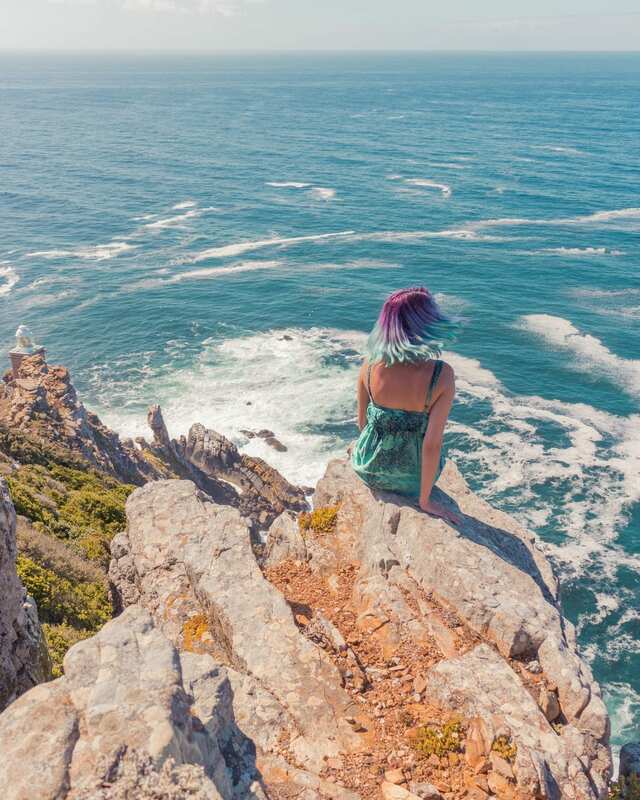 But if he has taken a few days off or is only blowing a few puffs – pack your best hiking shoes and head to Cape Point! Inside the reserve, you’ll find two of the city’s best overnight hiking trails. You’ll get to stay in rustic overnight huts, walk past wildlife and dramatic coastal scenery. But the hikes aren’t for the casual walker. You need to be comfortable walking more than 10 kilometres per day. The Hoerikwaggo Trail is the shortest of the two. It’s 18.5 km long and will take you two days to complete. But if you have the time, you can stretch the hike to a 5-day trial (75km) that will take you from Cape Point to the top of Table Mountain. The Cape of Good Hope Trail is a 2-day 33 km hike. It’s a circular route that starts and ends at Nature Reserve’s main gate and hugs the dramatic cliffs and wild beaches of False Bay. With incredible views and not another human in sight, it’s not hard to see why it’s one of the best things to do in Cape Town in winter. Sure, most of the things on this list are outdoor activities. But what about when the Cape Doctor is howling, and all you want is to warm up? Luckily, Cape Town has a bunch of museums to explore! Warm up while learning about the city’s history, art scene, or sporting prowess. Here are some of the best museums to visit in Cape Town in winter. 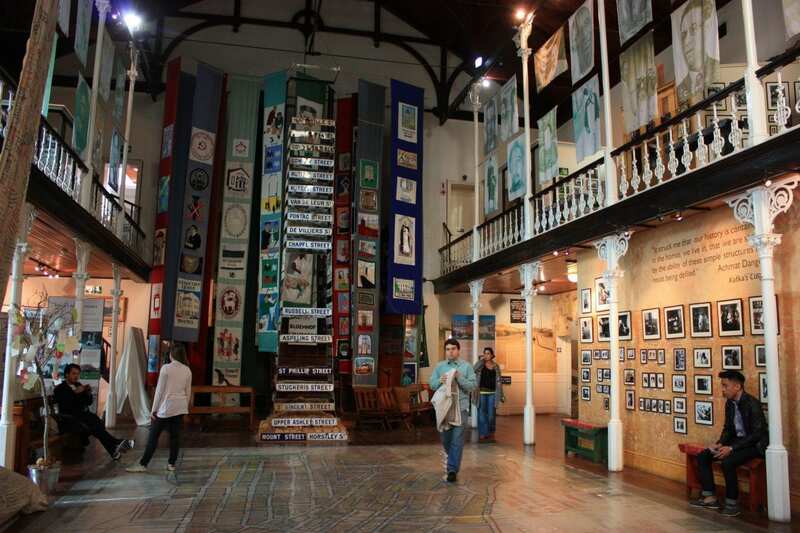 You can also get FREE entry to most of these museums with the Cape Town City Pass! Okay, so Lion’s Head is one of the city’s iconic sunset spots – but it’s also the busiest. If you’re looking for things to do in Cape Town in winter that aren’t super touristy, head to Kloof Corner. 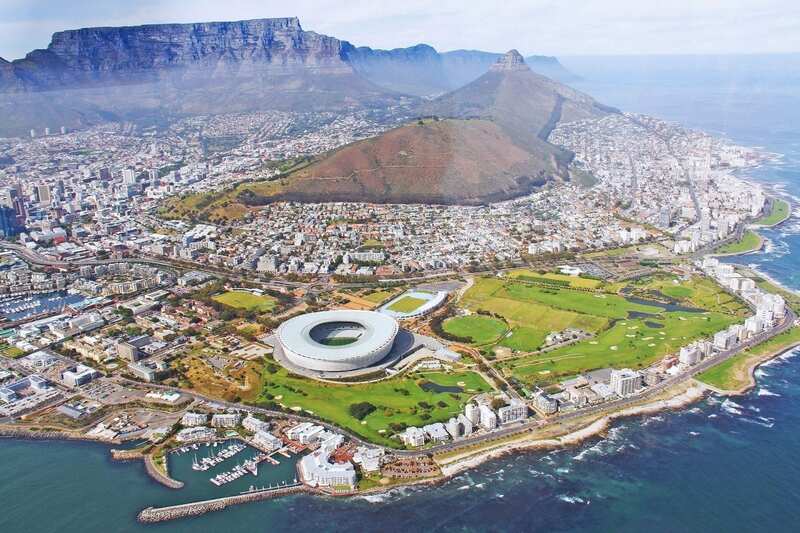 It’s only a short 20-minute hike up the slopes of Table Mountain and boasts views of the Twelve Apostles and Camps Bay. Beginning at Tafelberg Road, all you need to do is follow the steps up to the corner. The last part is the steepest, so make sure you’re wearing comfortable shoes. Pack some snacks, bring a bottle of your favourite wine, beer or cider and watch the sunset over the Mother City in style. Cape Town is a city full of history. And what better way to peel back it’s rainbow-coloured layers than with a walking tour! The city centre is flat, it boasts incredible modern and colonial architecture, and there are loads of delicious coffee shops to keep you warm on the way. Roam the city tasting South Africa’s multi-cultural cuisines. Learn about the history of apartheid in Cape Town and visit the spot where Nelson Mandela gave his first speech as a free man. Delve back deeper into the city’s past and meet the heroes and villains of the colonialism era. The variety is what makes it one of the best things to do in Cape Town in winter. I especially love food that I don’t have to cook. And stuffing my face at one of Cape Town’s food markets is my idea of heaven on a cold winter’s day. 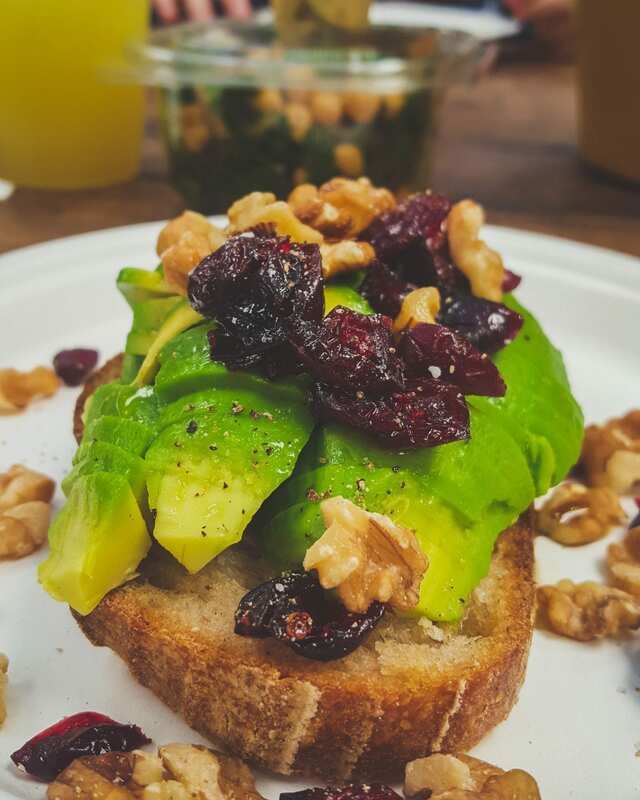 Try local delicacies like melktart, koeksisters and avo on toast. Or warm up with a bowl of curry, Phad Thai or a slice of pizza. Located in Sea Point, Mojo Market is open 7-days a week. It’s right across the road from Promenade and hosts a series of free live music events. Inside the venue, you’ll find designer retail stores, fresh goods and delicious food stalls. How’s your schedule looking for things to do in Cape Town in winter? If you only have time for one food market, make sure it’s the Neighbourhood Goods Market. It’s open every Saturday from 09:00 to 15:00 and caters to all kinds of diets. Can you even say you’ve Cape Town’d if you haven’t gotten day drunk at a wine farm? Since moving to the Mother City five years ago, I’ve spent my fair share of time doing just that. From Constantia to Stellenbosch and the lesser known Elgin Valley, I’ve drunk my weight in local wine. If you don’t have a sober driver or a car to get around, book a spot on the Franschhoek Wine Tram. You can get picked up from the CBD or drive to Franschhoek and spend the night. 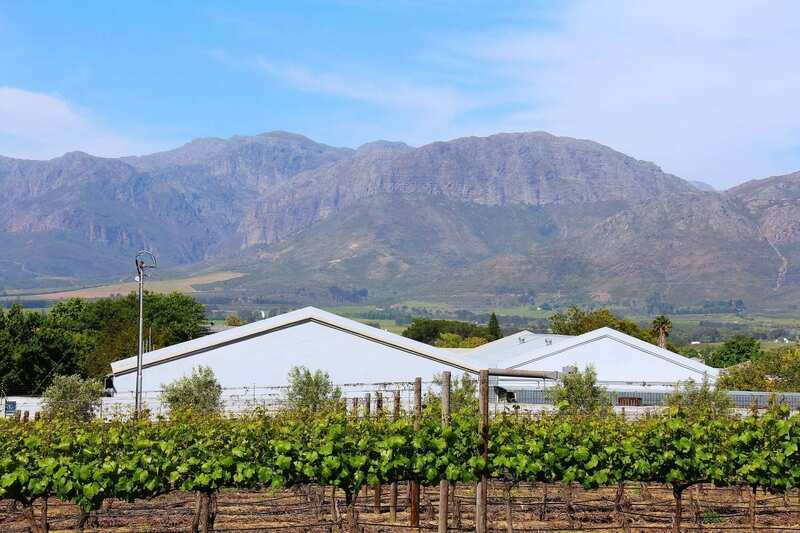 And of all the things to do in Cape Town in winter, spending the day hopping from one wine farm to the next sounds like the BEST way to keep warm. My all-time favourite wine farm. Try their Caracal vintage! After you’re sufficiently day drunk, spend an hour or two wandering around their Instagrammable gardens. Don’t leave without tasting their award-winning Black Dog Merlot and The Nix Sauvignon Blanc. There is something magical about a steaming mug of hot chocolate on a cold winter’s day. But I don’t mean that powdered stuff you can pick up from the grocery store. I’m talking about the real MVP. Hot chocolate made from scratch. So, where’s the best spot in Cape Town to grab a cup of that good stuff? It’s a chocolate cafe located on Wale Street that serves delicious hot drinks and a selection of sweet treats. HC even has vegan ice cream for all you peeps just like me who love eating a scoop or two in winter. If you’re taking a break from some of the other things to do in Cape Town in winter – it’s the perfect place to make a pit stop. 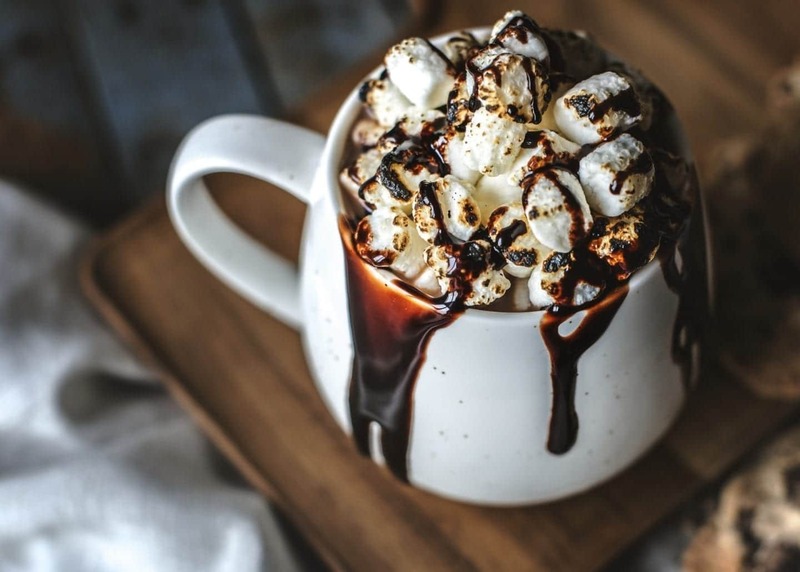 Not much of a hot chocolate drinker? Pick up an award-winning cup of coffee from Truth. It’s considered one of the best coffee shops in the world and features brews from all around the world. Now that you’ve got a few things to do in Cape Town in winter, find the perfect base for your adventures! The Grand Daddy: Staying at The Grand Daddy is a one of a kind experience. Located in the heart of the city, on Cape Town’s famous Long Street, you’ll have your finger on the city’s pulse. Book their rooftop luxury trailer experience and catch a film at the on-site Pink Flamingo Rooftop Cinema. Check prices and availability. B.I.G. Backpackers: Don’t let the word “backpackers” fool you. B.I.G. is one of Cape Town’s best boutique hostels. Stay in one of their deluxe private rooms or keep your costs down and book a bed in the mixed dormitory. The backpackers is only a 5-minute walk from the V&A Waterfront, and you’re a cheap Uber away from many of Cape Town’s top sights. Check prices and availability. Once in Cape Town: Once is one of my favourite hostels – EVER. Located on Kloof Street, it’s the place to stay if want to experience the best of the city’s nightlife. The hostel is known for its weekend DJ sets at the on-site bar, and you’ll be within walking distance of the many clubs and pubs nearby. Plus, breakfast will only set you back R 45.00! Check prices and availability. 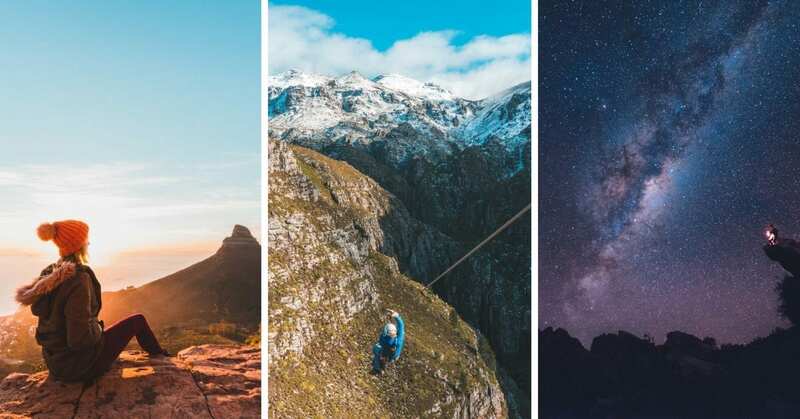 Which of these things to do in Cape Town in winter are you most excited to try? Did I inspire you to travel the world on a shoestring? Subscribe! I'll send you my most ridiculous travel stories and budget travel tip in monthly (ish) newsletters. Did you find this post about things to do in Cape Town in winter useful? Save it for later on Pinterest! I’ve never thought about visiting Cape Town in the winter before, but you may have sold me! Your photo of the Milky Way is beautiful! Thanks so much Kelly! Travelling to Cape Town in the winter is such a different experience to the busy summer months.